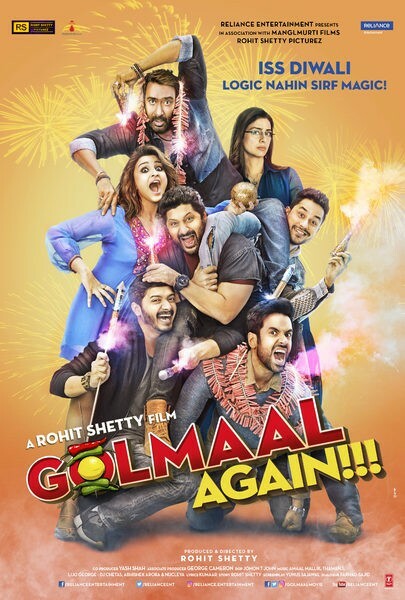 Golmaal Again is yet another fun filled ride about two gangs who are unable to stand each other since their childhood and how they repulse each other even after they grow up. But soon they come across Khushi, an orphan just like them, who, as her name suggests, brings happiness in their life. On meeting the Golmaal gang, Khushi realizes that they are the only ones who can help her, and the boys also find her cause worth fighting for. In the comical journey that follows, Gopal, Laxman and Madhav, Lucky & Laxman keep their differences aside and come together along with the rest of their gang and what follows is yet another hilarious adventure with its fair share of thrills that are sure to surprise the audience and fill their hearts with laughter and joy. It is a film that will surely make everyone laugh, cry and realize the importance of how beautiful life is.